Mom’s sugar cookies continues to be an old favorite. It’s a simple recipe because of the hint of spice she adds to the dough. Despite Dad’s elaborate holiday dinners, Mom would make a brief appearance in the kitchen to quickly make her famous cookies. Sometimes she would call my sister and me to help decorate the cookies, and sometimes we came downstairs without Mom asking for help. Now that my sister and I are no longer living in the house, whenever we come home, we demand Mom make her famous sugar cookies. Back then, it was only a television that provided easy distraction. Holidays were less about electronics. Days off weren’t dependent on social media, the number of ‘likes,’ and streaming videos online. 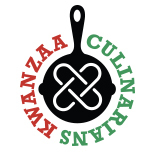 For the last few years, I’ve spend the holiday — days off from work — working on Kwanzaa Culinarians. When returning to work in the new year, I felt as if my holiday wasn’t exactly special (although, I was proud of my work) as I seamlessly went from working on a home to work computer. This year, I’m inspired from Solange’s “Rise.” I’m unplugging from electronics and social media. Which means, I’ve decided not to do Kwanzaa Culinarians this year. Its 50th anniversary will be celebrated offline. Instead I’m getting out of the kitchen to move around outside my apartment. Visit a few art exhibits. Wake up without an alarm clock. Physically say hello to friends I rarely see. And, I will leisurely bake and cook without thinking about My Life Runs On Food or Kwanzaa Culinarians. When it’s time to return to work, I want to feel happy and relaxed. No regrets. And, happy to see a computer. Maybe there’s a few leftover holiday cookies to share with co-workers. Habari Gani? Happy Kwanzaa 2016. This entry was posted on December 26, 2016 by Sanura of MyLifeRunsOnFood.com in 2016, Personal Story and tagged 2016.